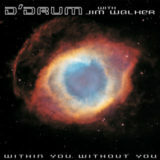 D’Drum’s second CD, Within You Without You, features renowned flutist Jim Walker as guest artist. The CD features music derived from traditional cultures of Bali, Africa, Persia, and other regions blended with the influences of Western Classical and Jazz forms. All of the instruments featured on recordings and in performance are acoustic, and of traditional and contemporary design. Jamal’s debut cd features ethnic percussion and electronica in an exotic mix of Middle Eastern and Jazz compositions. 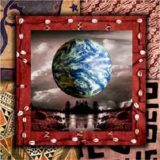 Archetribe fuses influences from all over the world including Armenia, Hungary, Lebanon, Bali and Egypt with modern textures and driving world percussion to create an unusual, yet organic listening experience. Recording of Earthtones began with the foundation of Jamal Mohamed’s doumbek percussion tracks. 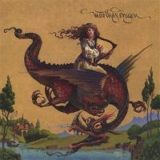 Matthew Davidson enlisted the help of flutist Ken Field (Birdsongs of the Mesozoic), bassist Dave DeMarco (Battery Apple), and synthesist Larry Fast (Synergy, Peter Gabriel) to create the bed of textures onto which Gunnard Doboze’s haunting duduk tracks are prominently featured. 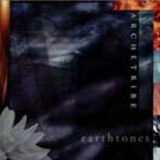 Listen to Abyss Crossed from the Archetribe CD, Earthtones. D’Drum is a five member percussion group from Dallas, Texas. Featured in an Emmy award winning PBS short film that documents their travels and observations as related to World Percussion, the group has performed and recorded extensively. On the island of Bali there is a village named Petulu. At dusk each day the sky begins to flutter, beautiful white V formations, thousands of white Herons flying in from all over the island, ruffling and maneuvering into their favorite nesting place. In 1967, a temple was dedicated to the memory of the 50,000 lives lost in the recent bloody civil war. During the week of the dedication, flocks of elegant white birds began to arrive, more and more, until thousands of winged souls would roost together over the villagers at sunset, then fly away at dawn, a spectacle that continues to this day. With the belief that the birds are the embodiment of loved ones who were lost, Petulu breathes in and out with each arrival and departure, knowing that life is never ending, in a Village Beside Time. Buy Village Beside Time on iTunes. 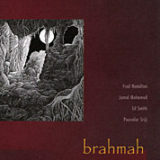 Brahma’s music combines American jazz with elements of Middle Eastern, Indian and Balinese traditions. Original compositions and unique arrangements of traditional themes are performed on a variety of percussion and string instruments — the core being doumbek, mridangam, vibraphone and guitar. Harpist Martha Gay, fiddler Malcolm Smith and flute and recorder specialist Bob Bielefeld joined forces at the Texas Renaissance Festival in the early 70’s with a common love for ancient melodies and a flair for jamming. Their passion proved a marvelous alchemy as they were joined in the 80’s by cellist Max Dyer and later by Chilean multi-instrumentalist Conrado Garcia. Founding member Malcolm Smith died in 1996 to be succeeded by Boston fiddlers Mark Caudill and Michelle Levy, gamba/lute player Alex Korolov, and most recently, Austin TX based fiddler Sick. Cantiga is joined by drummers Ray Dillard, Nestor Prieto and most recently Jamal Mohamed for recordings and concerts.